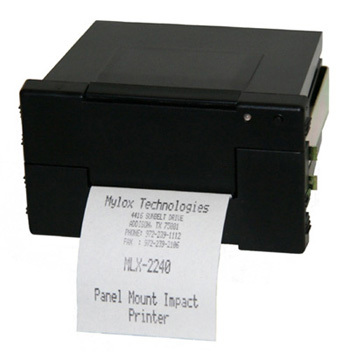 The MLX-2220 and MLX-2240 from Mylox Technologies incorporate the popular Epson M190 and M192 impact dot matrix printer mechanisms and a highly customisable interface board. Paper loading and ribbon changing is from the panel front for easy maintenance. The panel also incorporates a status LED and paper feed/self test button (customisable function). Industry standard panel cutout dimensions and multiple software emulation modes make it an ideal choice as a second source device or as an upgrade to your existing panel printer. Depth behind panel does not account for electrical connectors for which allowance must be given. Please order a printer for physical evaluation before committing to your final panel design. This value does not include the 9-35V DC optional power board which can (but doesn't need to) mount on the back of the panel clamp adding approx. 29mm to the overall depth. The printout from impact dot matrix printers is less prone to fading over prolonged periods. This means they are preferred by many for applications requiring long term data archiving. Industrial Data Logging, Remote Fault Recording, Temperature monitoring, Weighing, Fire & Security Systems. Also used in vehicles for monitoring; load weights, temperatures, position tracking and radio messaging etc..